This Ongoing War: A Blog: 14-Dec-15: What do the Palestinian Arabs think? 14-Dec-15: What do the Palestinian Arabs think? Almost three months ago, we wrote here ["22-Sep-15: What do the Palestinian Arabs think?"] about a public opinion survey conducted among Palestinian Arabs by the Ramallah-based Palestinian Center for Policy and Survey Research (the PSR), headed by a respected pollster, Dr. Khalil Shikaki. data-backed insights into what the people on the other side of the boundary say they feel when they are talking to their own rather than to the BBC or France24. Two-thirds demand that Mahmoud Abbas, who was elected in January 2005 to a four-year term as president of the Palestinian Authority and has held tenaciously onto power for eleven years with no election on the horizon, must resign. 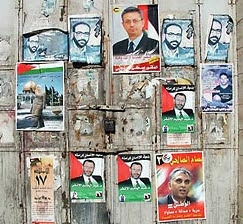 If, which seems unlikely, presidential elections were held today, the Hamas candidate would win a clear victory against Abbas. There's no room for doubt that terrorism has the Palestinian Arabs firmly in its grip. The numbers show clear, unambiguous and widespread support for a violent, armed intifada against the Israelis: 60% support it today, up from 57% in the PSR September 2015 poll. The cohort most opposed to a two-state solution and most supportive of "an armed intifada and stabbings" is the one aged between 18 and 22. When columnists and analysts speak of the desire of Palestinian Arabs to live in peace, to get on with ordinary, quiet, constructive lives - as compelling as this interpretation is, the data don't support it. Anyone paying attention to the incitement pumped, generation after generation, into their communities and heads will not be surprised. Since we wrote that, the Palestinian Arab stoning/ramming/shooting/stabbing war against Israelis has erupted and continues to rage, with the Abbas regime providing much of the incitement that fuels it. Ignoring what Palestinian Arabs say to their own pollsters - which we see political leaders and commentators doing when they propound certain kinds of rosy Middle East visions and bitter criticisms of Israel - is a huge mistake. What the people living on the other side of the fence are saying is clear, credible and measurable. Being optimistic about the prospects for the sort of painful compromise that leads to peaceful relations is counterfactual and foolish, as much as we wish it were otherwise. That's something we wish the public figures pushing their "peace" "plans" would internalize. It also means cruel and vicious attacks like tonight's car-ramming assault on unarmed Israelis standing at a bus stop are certain to continue. So too will the disgraceful glorification - by the entire Palestinian Arab power structure starting with its double-talking president - of the terror-minded attackers and those who step into their shoes once they are eliminated.